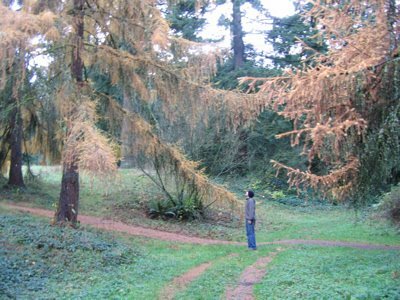 This is Mark admiring a dawn redwood in the Hoyt Arboretum in Washington Park, Portland. (He came up to see me and Portland for the weekend.) When I first saw them a few weeks ago, I was alarmed. Redwoods are supposed to be green! Are these sick? No. They get to turn colors in the fall with the other trees. It is truely a beautiful sight. I’m leaving Portland today to head down the coast, which, miraculously, has a forecast of partly sunny for the next few days! This entry was posted in Uncategorized and tagged redwoods, vacation. Bookmark the permalink. Did you know we have dawn redwoods in Palo Alto? They were thought to be extinct for many years until they were rediscovered in a grove in China around the 1940′s. Then many specimens were brought back and planted in the US. Every year around this time I get calls at work from people who think they are dead redwoods. I think they’re cool.